A home in the remote forests of Papua New Guinea’s Huon Peninsula. Photo by Ryan Hawk/Woodland Park Zoo. In the remote forests of Papua New Guinea’s Huon Peninsula, we’re brewing up something exciting with subsistence farmers—the first coffee you’ll ever have the chance to drink from this region. Freshly picked coffee cherries. Photo by Ryan Hawk/Woodland Park Zoo. 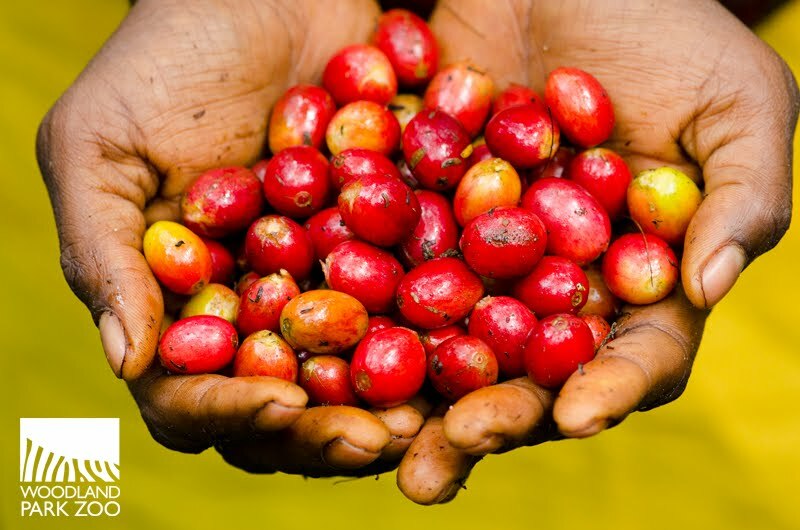 More than a tasty drink, this coffee is on a mission: to create a better life for the villagers of Papua New Guinea who have pledged their own land to conservation. 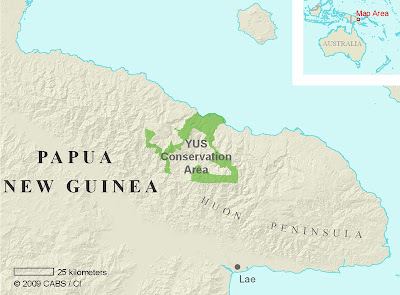 Map of Papua New Guinea showing the YUS Conservation Area on the Huon Peninsula. 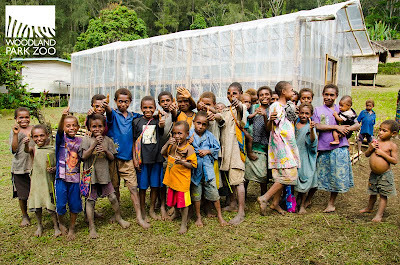 Back in 2009, the indigenous clans of the Huon Peninsula worked with Woodland Park Zoo’s Tree Kangaroo Conservation Program (TKCP) to make history, pledging parcels of their own land to permanent protection under the Yopno-Uruwa-Som Conservation Area (YUS CA), Papua New Guinea’s first ever protected Conservation Area. 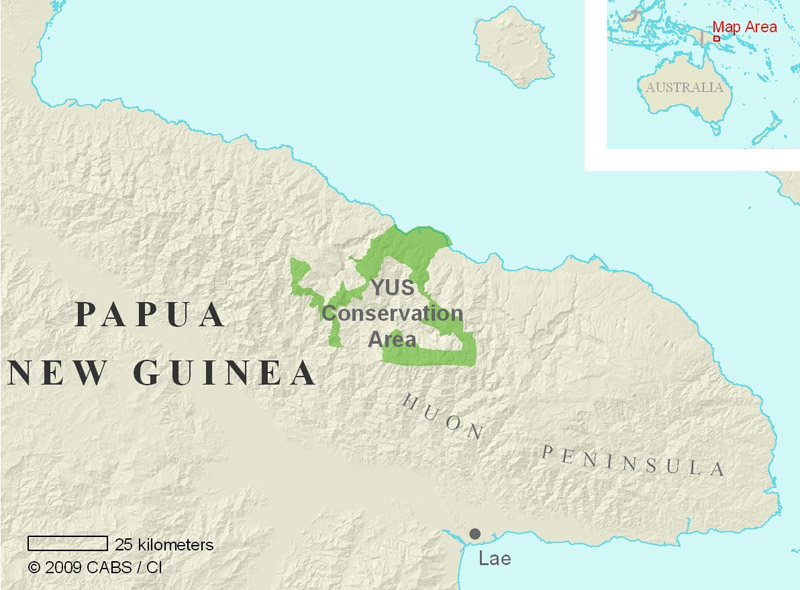 The YUS CA protects critical cloud forest habitat for several endangered species endemic to Papua New Guinea, including the Matschie’s tree kangaroo. Matschie’s tree kangaroo. Photo by Russel A. Mittermeier/Conservation International. In return, TKCP is working with these landowners to develop alternative sources of income that protect the natural resources vital to the local people’s subsistence lifestyle, while providing them with economic incentives to continue to collaborate on conservation efforts. That’s where the coffee comes in. 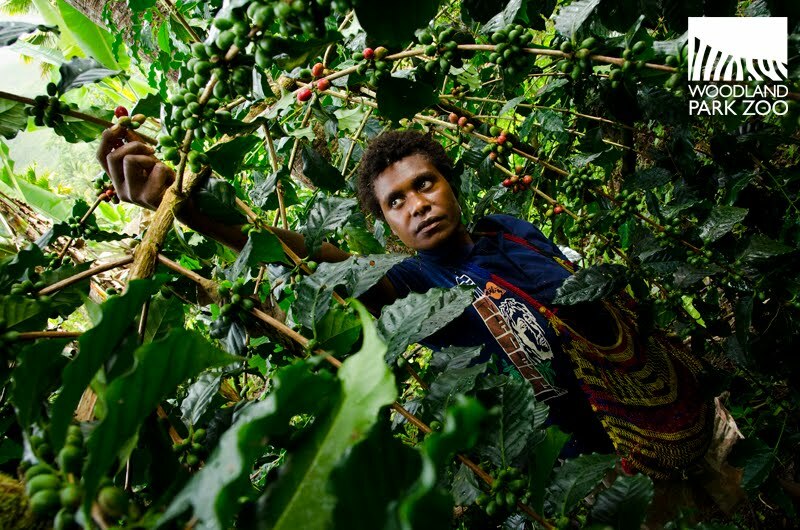 A grower picks fresh coffee cherries in Papua New Guinea. Photo by Ryan Hawk/Woodland Park Zoo. 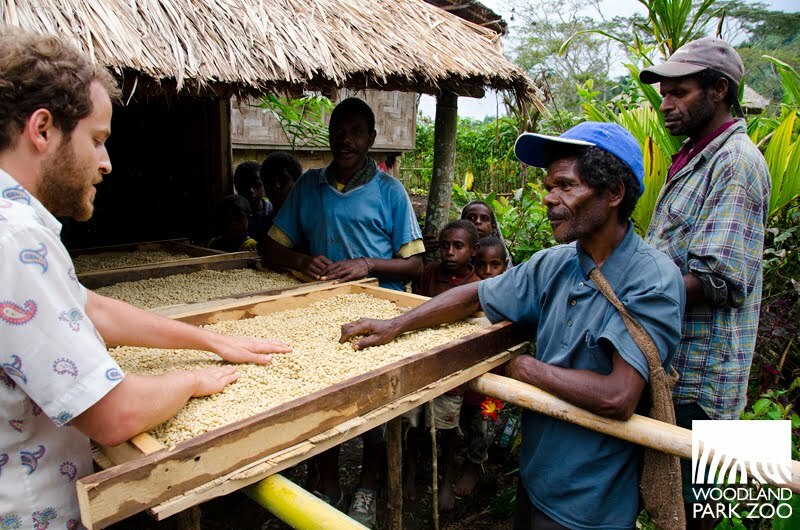 Coffee means a future for these farmers. It means their first-ever cash crop that will provide money they need to send their kids to school. Kids gather near a solar coffee dryer built with support from TKCP to improve quality and consistency of the village’s coffee. Photo by Ryan Hawk/Woodland Park Zoo. 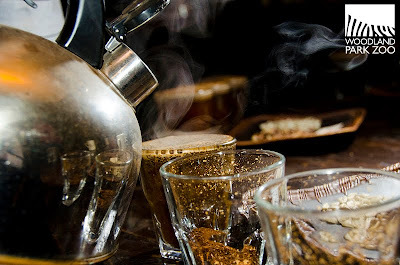 But coffee does not come without its challenges. Picking coffee cherries in the shade. Photo by Ryan Hawk/Woodland Park Zoo. 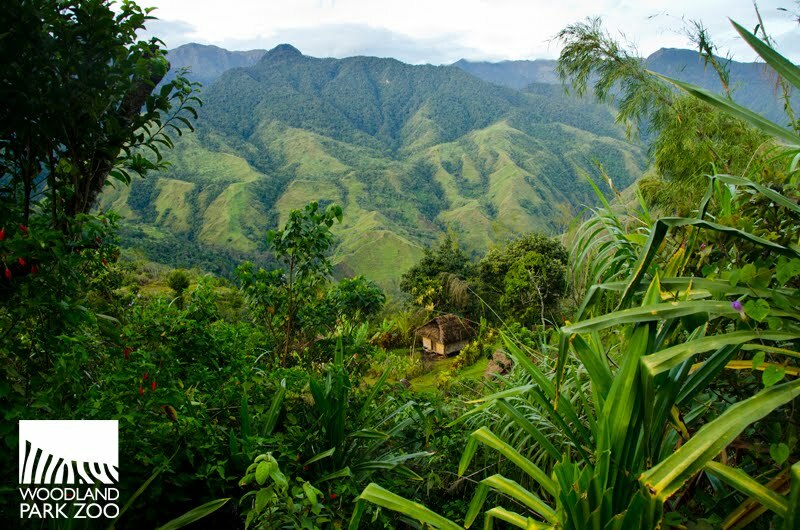 It’s true that Papua New Guinea has an ideal climate and altitude for growing high quality coffee, and by using traditional cultivation methods, the coffee gardens are inherently organic and predominantly shade grown. In fact, coffee from Papua New Guinea is in high demand from gourmet coffee roasters worldwide. 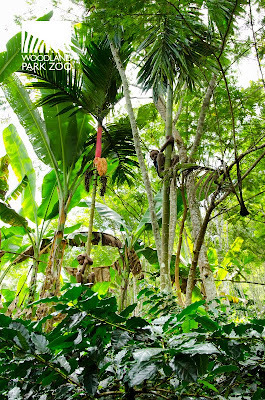 The layers of the forest: Children climb trees for nuts, while coffee (seen in the foreground) grows under the shade. Photo by Ryan Hawk/Woodland Park Zoo. 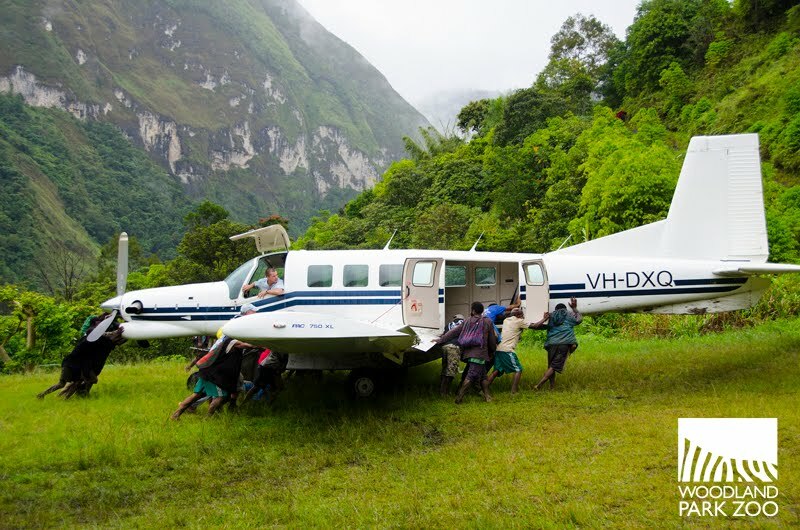 However, the Huon Peninsula is characterized by some of the most extreme, rugged landscape in the civilized world, meaning the villages of YUS are remote and accessible only by small plane service. 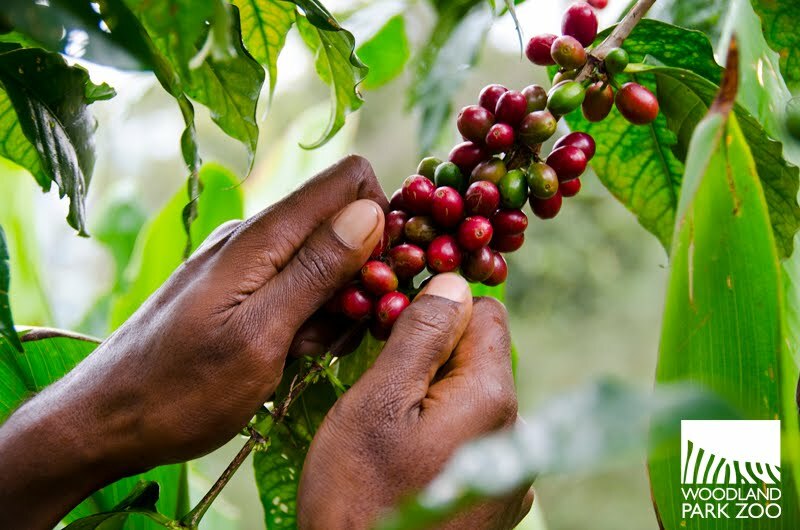 In the past, the high cost of small plane travel and freight has made the profit margin for YUS coffee growers to sell their product in coastal towns and to exporters prohibitive. 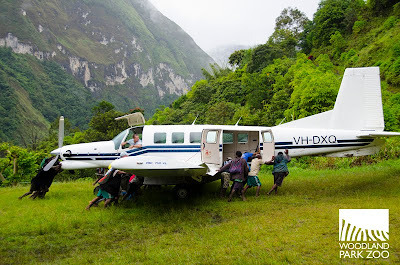 Traveling in and out of the remote forests of the Huon Peninsula can be challenging and expensive. Photo by Ryan Hawk/Woodland Park Zoo. With support from Conservation International and the German Development Bank (KfW), TKCP has led a pilot initiative over the past two years to make this conservation coffee a sustainable and profitable income-source for YUS communities. The goal is to increase the price that YUS coffee growers receive for their product, as well as pay growers directly, thereby overcoming the market hurdles to a profitable return, while also ensuring the product leads to increased support for conservation in YUS. Daniel Shewmaker of Seattle’s Caffé Vita advises growers on best techniques for drying coffee. Photo by Ryan Hawk/Woodland Park Zoo. 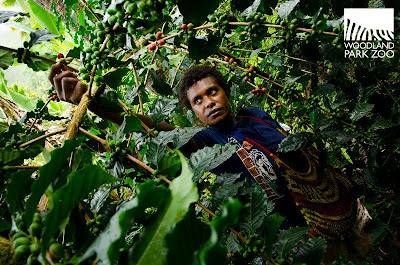 To do so, TKCP has worked with PNG’s Coffee Industry Corporation to train YUS coffee growers on farming techniques for maintaining bio-diverse shade cover, garden intercropping, tree pruning, and proper bean harvesting and drying techniques. With these improvements to quality, and the conservation message of the project, YUS growers will soon have the opportunity to sell their beans as a gourmet commodity in the Seattle market. Caffé Vita brews samples of the Huon Peninsula coffee to test for quality and consistency. Photo by Ryan Hawk/Woodland Park Zoo. In culmination of these efforts over the past two years, TKCP staff just returned from a trip to YUS with the coffee buyer from one of Seattle’s premier coffee roasters (and Woodland Park Zoo partner), Caffé Vita. The trip was an incredible experience, and is leading to some exciting news for Seattle’s coffee drinkers and zoo fans this fall. Stayed tuned to the zoo blog for more on our Papua New Guinea trip and the conservation coffee that will be hitting Caffé Vita shelves soon! Thank you for all of your efforts! I insist on using Shade Grown, Organic coffee and will look forward to hearing more about this project. 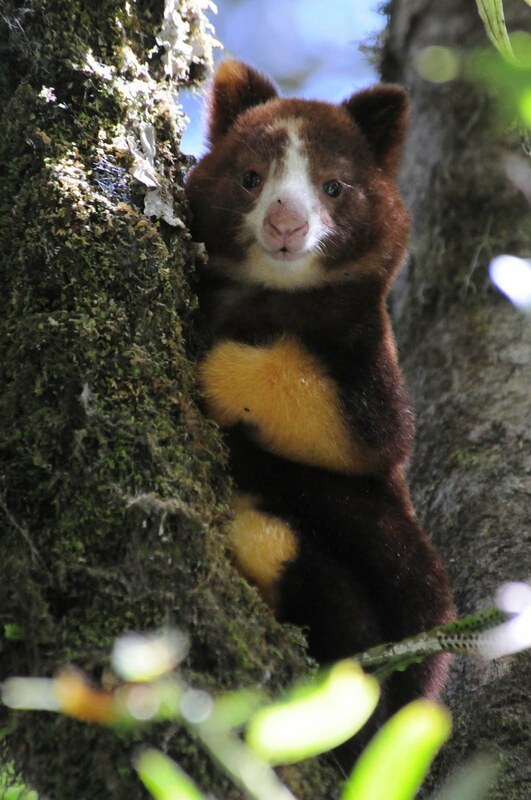 I am doing a documentary on tree kangaroos and this website has been very useful!